Call Today for a Live Assistant! The Proof is in the Plumbing! Looking for tips on services? Want to know how industry changes will effect your family? 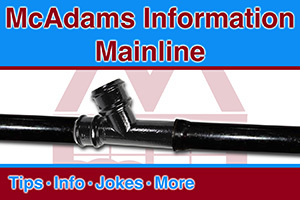 Check out the McAdams Plumbing Mainline Info blog to learn, laugh, and stay informed about the industry. McAdams Plumbing, Inc. has a rich history of community involvement. Stop in to see what we are up to in your neighborhood and how our company is working to make a positive difference. 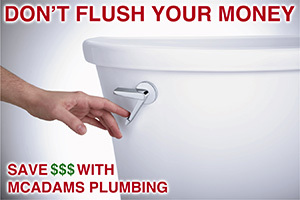 Find out what great money saving deals the pros at McAdams Plumbing, Inc. are offering this quarter. Make sure to stop by often for new specials. McAdams Plumbing, Inc. is a DynaQuip Certified WaterCop Installer.